Editor’s Note: I’m very pleased to introduce today’s guest speaker! Please meet Erica Whelan, the exceptionally talented hair and makeup artist whose work can be seen everywhere from the runways of New York Fashion Week to the glossy pages of your favorite editorials to some of the most fabulous private clients. 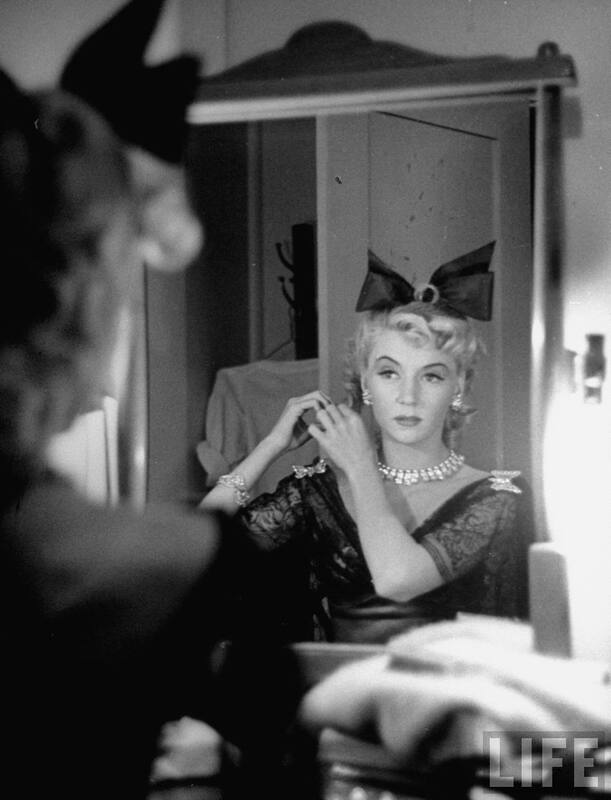 Indeed, whenever we catch up, she’s always got several new stories and numerous beauty tricks up her sleeve. She’s my own secret weapon! If you are not yet familiar with Erica, it is my pleasure to introduce you. 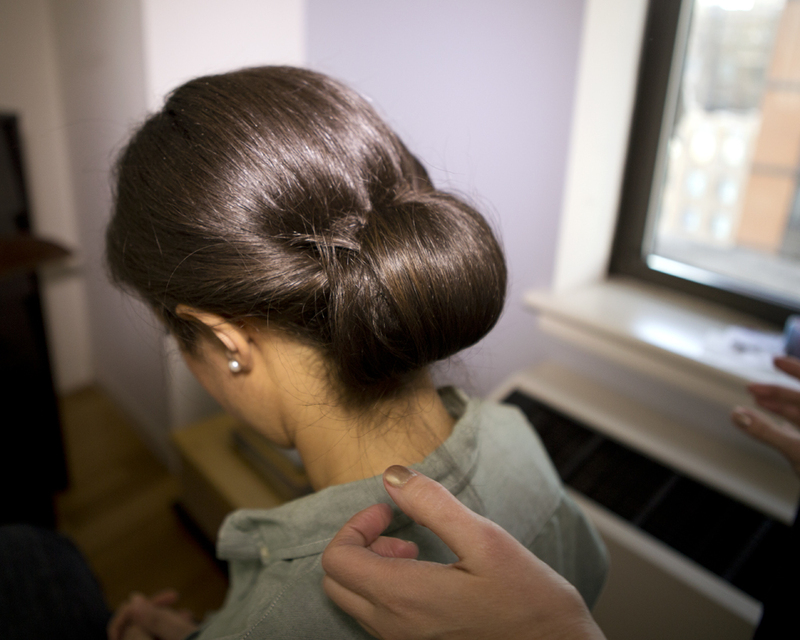 For her lesson, I requested she share a simple updo, something everyone should have in their styling arsenal. 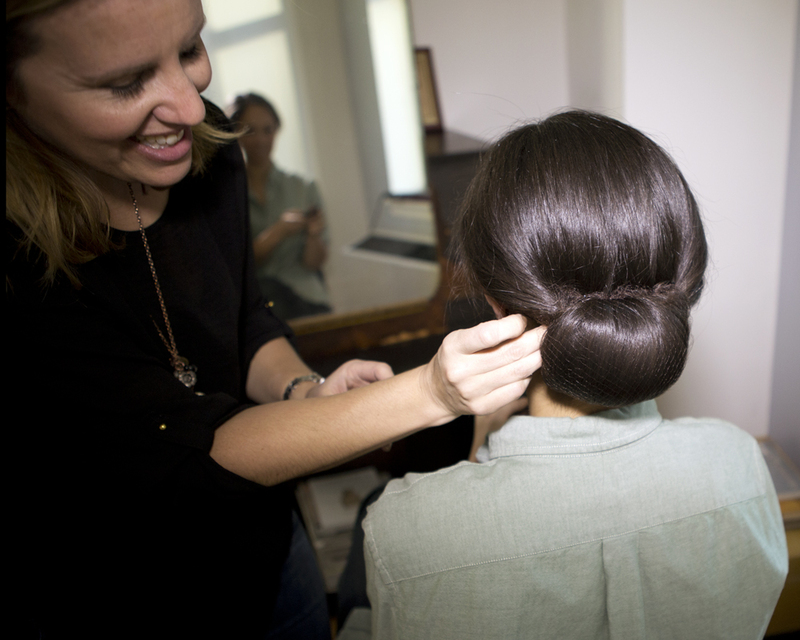 Good for everything from board meetings to brunch to broadway show, think of this classic chignon as a style soldier of fortune, able to handle any sort of occasion you might throw at it. You might also recognize the guinea pig in the chair…I knew all this hair was good for something. Without any further ado, Erica’s tip for a charmed life. Photos by the equally talented Amelia Tubb. You will need a teasing comb, boar bristle brush, an elastic ponytail holder, bobby pins, hair pins, texturizer spray and hairspray. Depending on your hair type you may also need a flat iron and smoothing crème. 1) Hair can be clean or slightly dirty (“second day hair”). 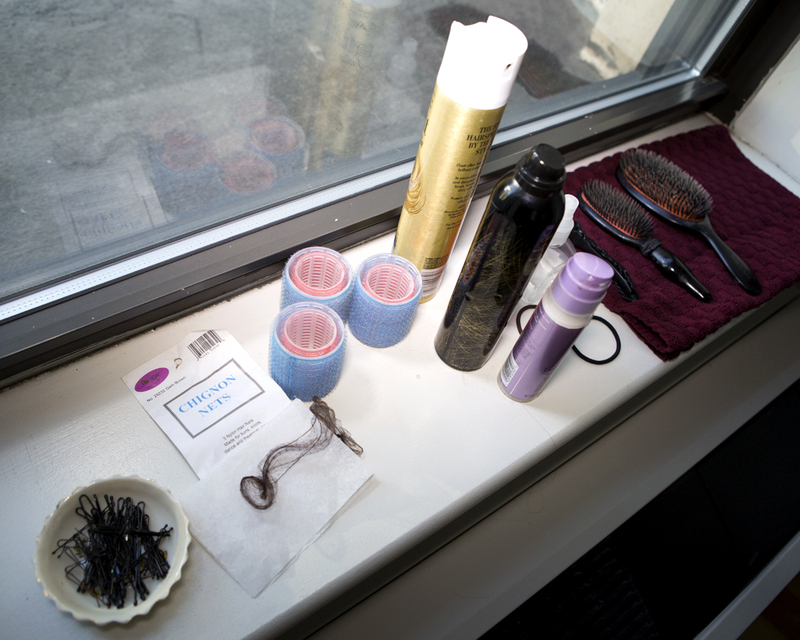 Get volume in the top section of hair by spraying a dry texturizer spray like Oribe or dry shampoo like Klorane. This will instantly add volume to dry hair. Hold hair straight up and away from head then spray at the root. Wait a few seconds then massage product into your roots. 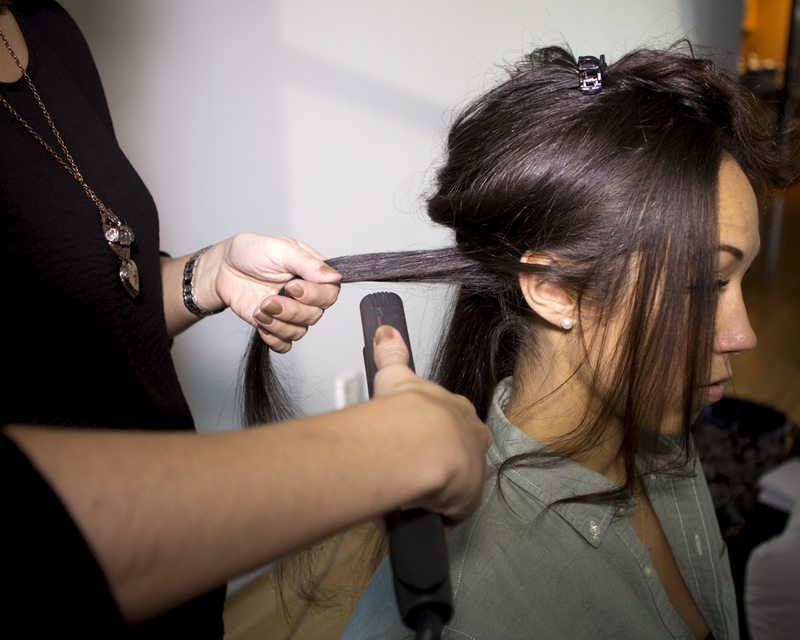 If your hair is curly, you should use a flat iron to straighten and add shine to your hair. 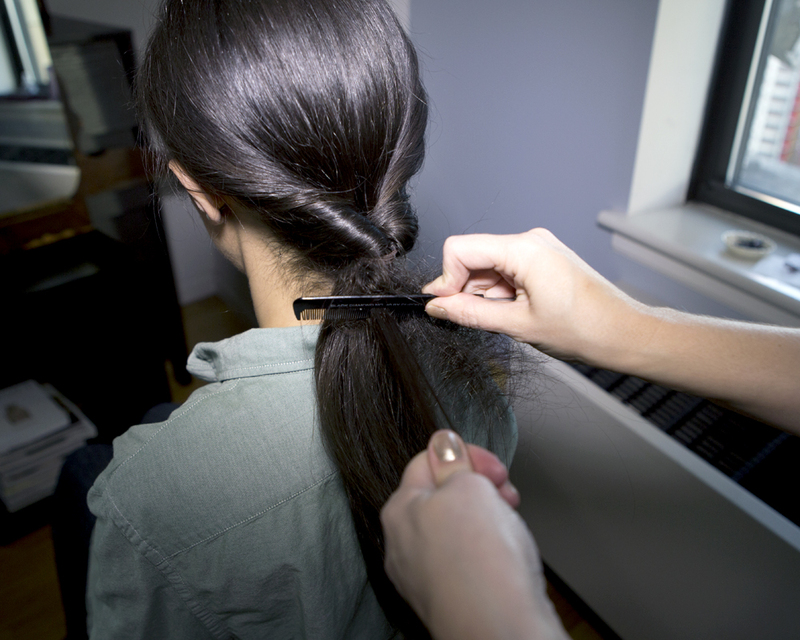 2) Brush hair into a low ponytail. I usually position my ponytail at the occipital bone, which is the bone you can feel at the back of your head. 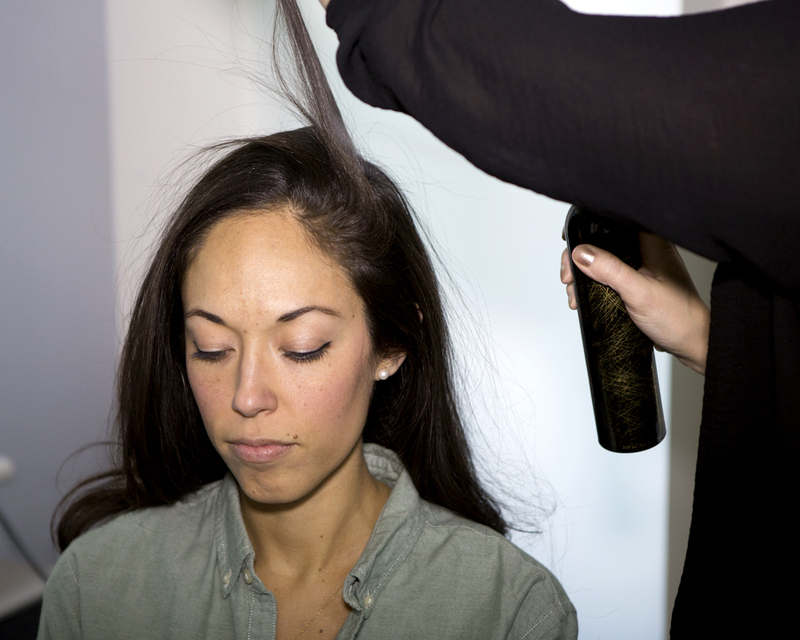 I like to spray my brush with hairspray before I brush the hair into a low ponytail — this trick will help tame flyaways. Your ponytail should be smooth. 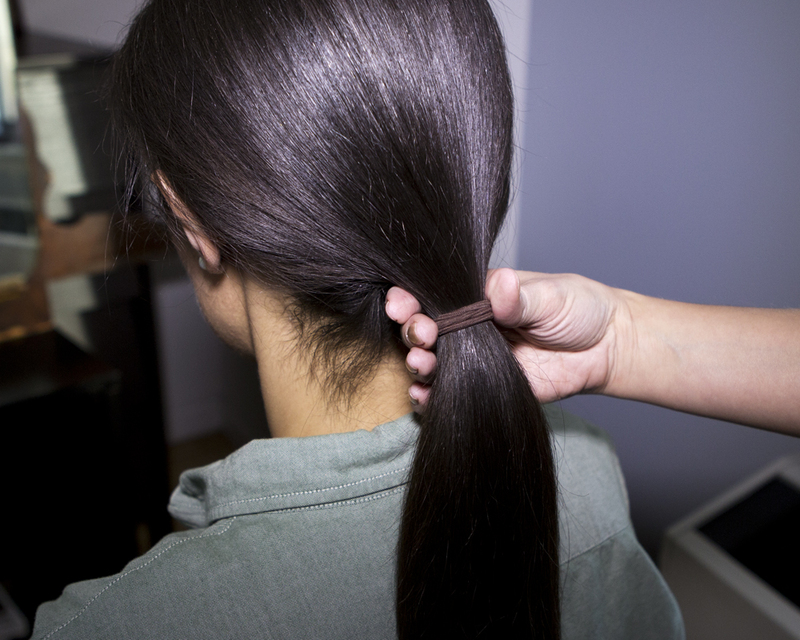 You can use a dime-sized dollop of smoothing crème and run over your ponytail to remove any frizziness. You can style the front of your hair to your liking. 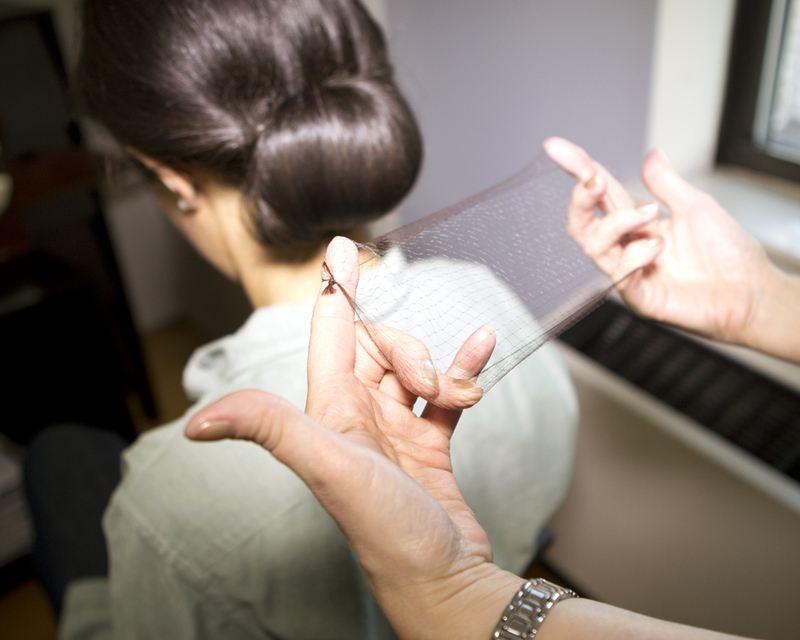 Ex: a few pieces of hair framing your face, a middle or side part, or backcomb the top section for volume — your choice. 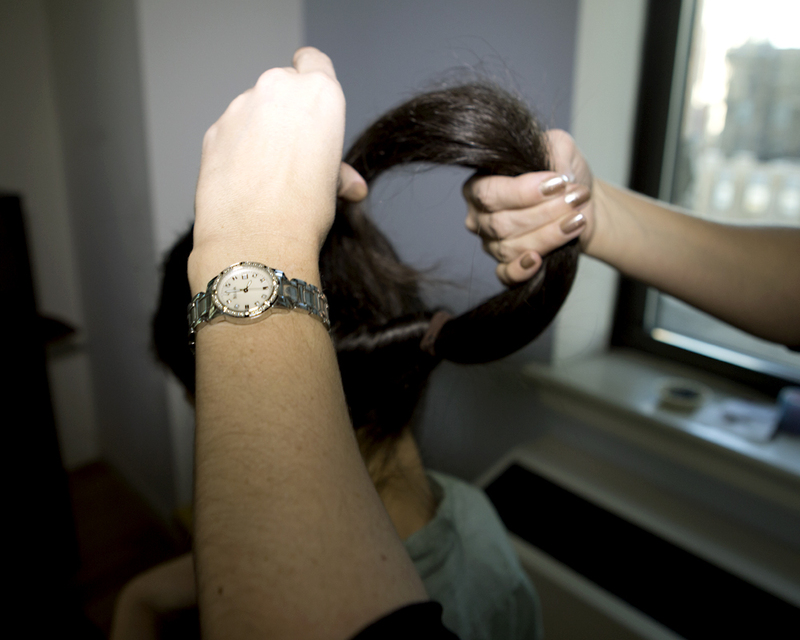 3) Once your hair is in a low ponytail, slide the ponytail holder about an inch down. This will give you enough room to split the hair down the center. 4) Split hair down the center then flip the ponytail up. 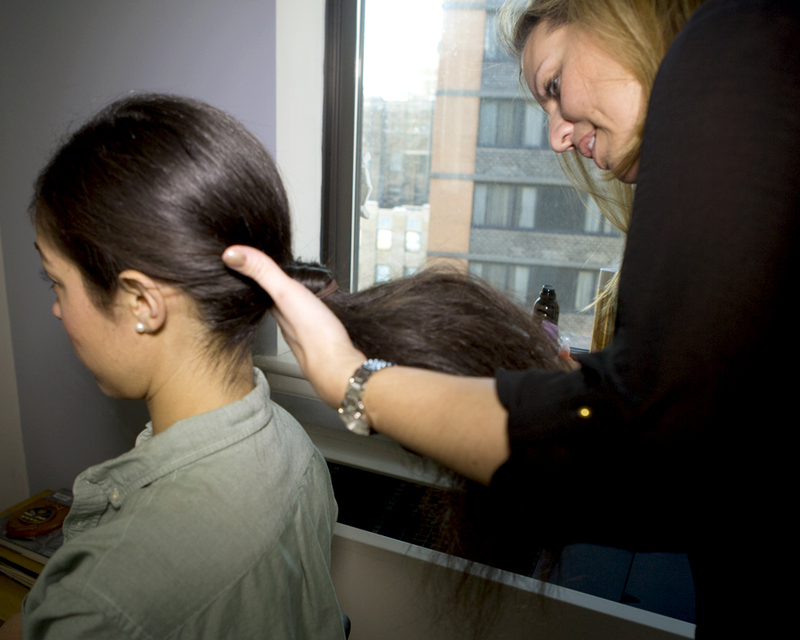 Starting with the ponytail end, begin feeding it through the split. 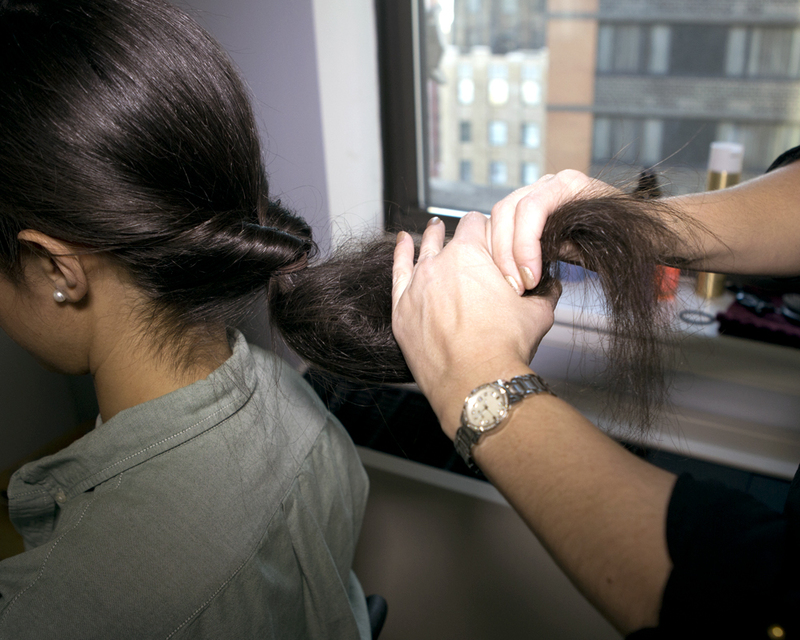 Grab the ponytail with your fingers from underneath and pull it through the split. 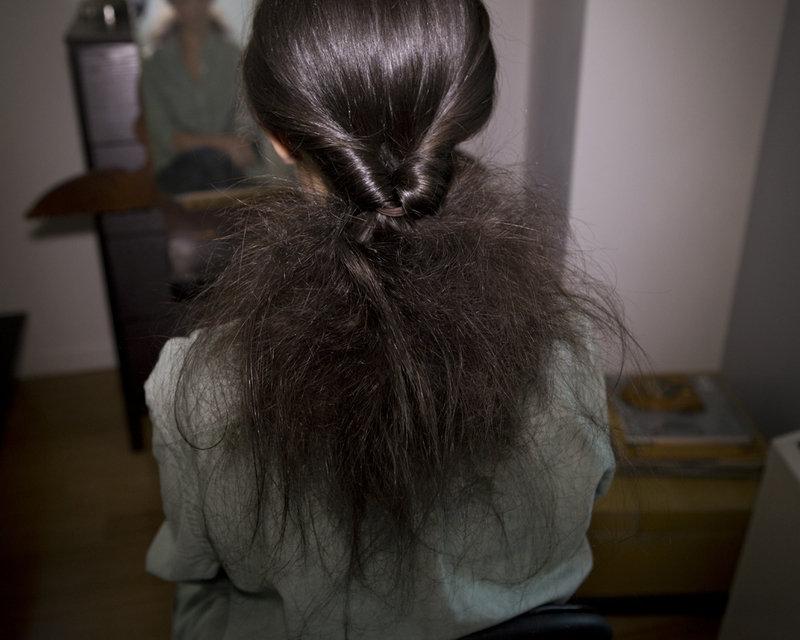 5) Give the ponytail a gentle tug so it tightens back up. 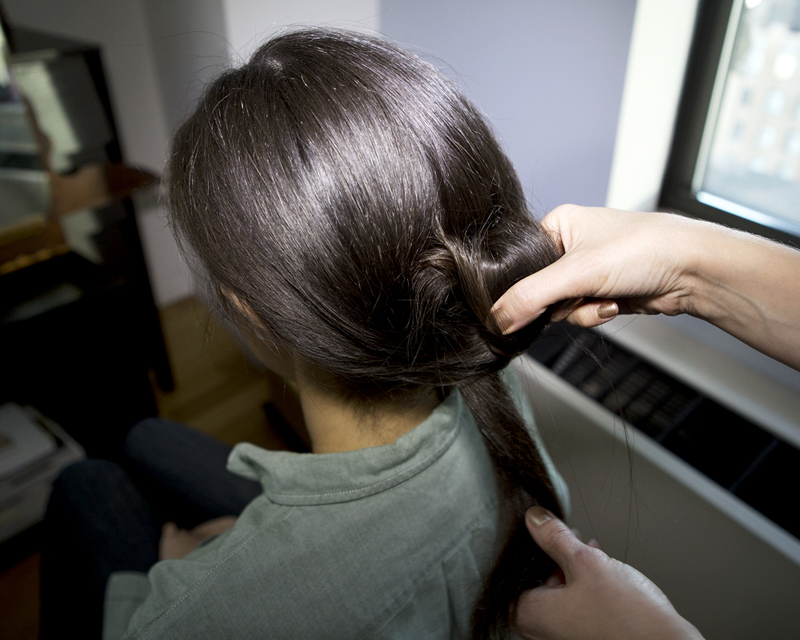 6) Use a comb to tease the ponytail. This will create the base for your bun. Tease as much or as little as you like. Remember, the more you tease the bigger the bun. 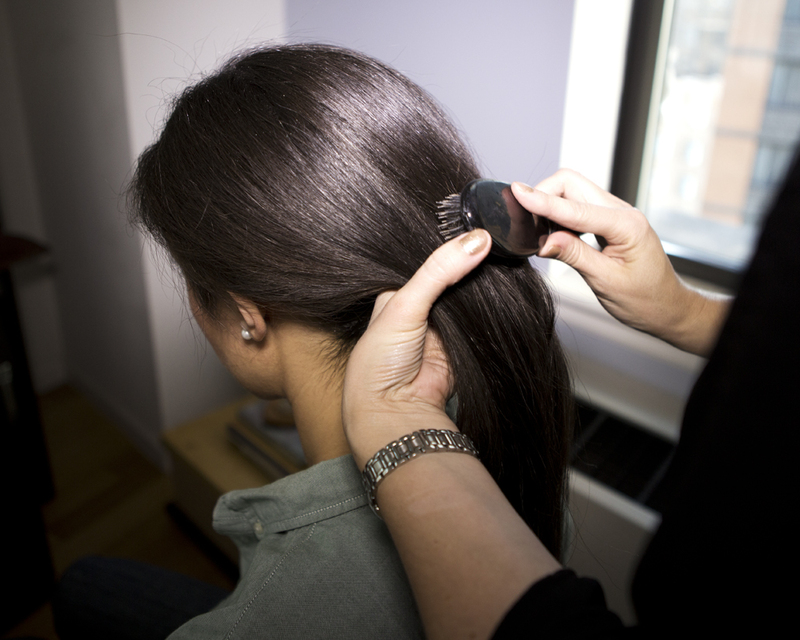 Once you’re done teasing, smooth the underside of the ponytail with your boar bristle brush. This is the side that will be visible so it needs to be smooth. 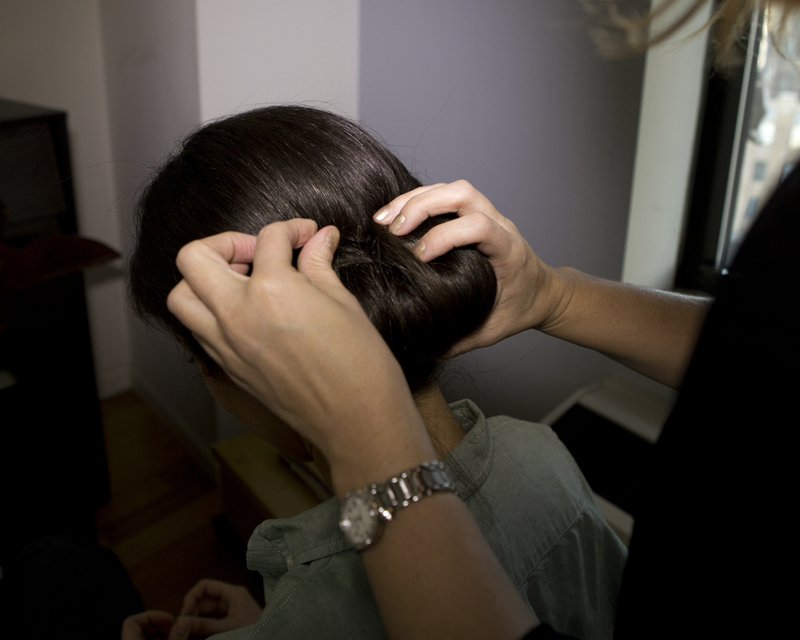 7) Put the back of your hand on the inside of the ponytail (the teased part of the ponytail) about mid-length. 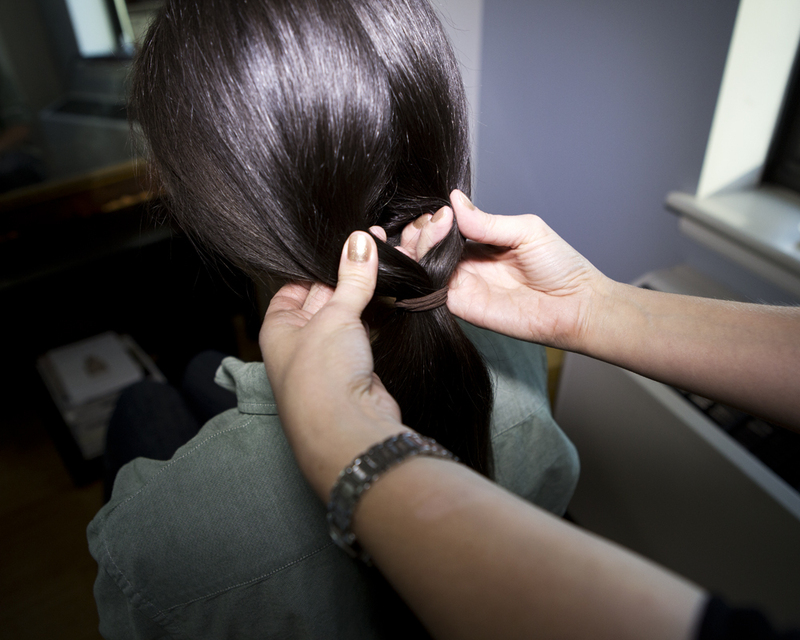 Wrap the ponytail around your hand and tuck the tail into the hole you created when you split your hair down the center in Step 4. Keep tucking until you form a bun. 8) Using bobby pins (medium size for short to medium hair or large size for medium to long hair) secure the bun. I like to use two bobby pins at the top where we tucked the tail into place. Then gently pull apart the bun to make it fuller. Then continue to pin into place. 9) My secret weapon to keeping hair in place is to use a hairnet. Hairnets come in different colors so you can find one that matches your hair color and the mesh is so fine that no one will be able to detect it up close or in photos. 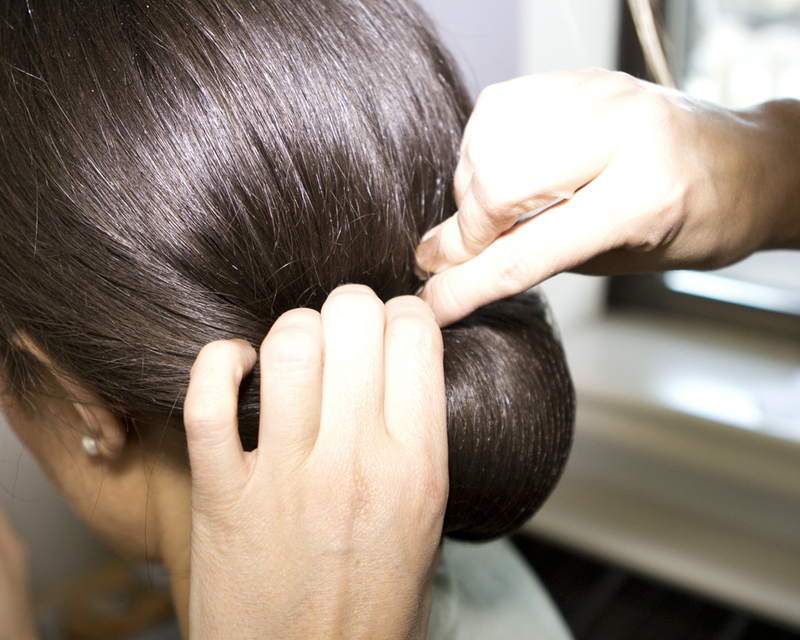 Cover bun with hairnet then pin into place using hair pins. Make sure to grab the hair and then the net when you pin. FYI – A hair pin is a u-shaped pin that is lighter than a bobby pin. Bobby pins secure a hairstyle into place where as a hair pin keeps the hair in place once the style has been secured. 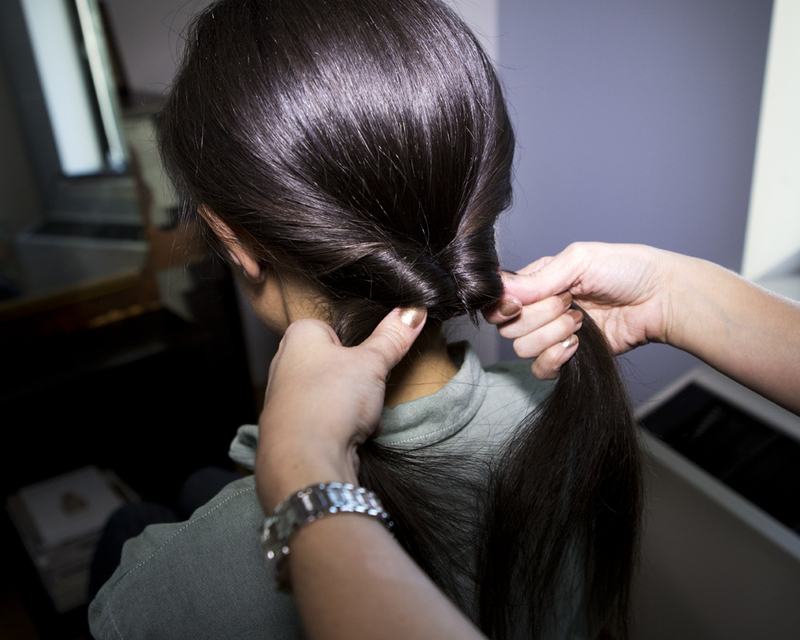 10) Final step – spray with hairspray to keep in place and tame any flyaways. All done! Wow…She is good….But it’s hard to screw up Natural Beauty! 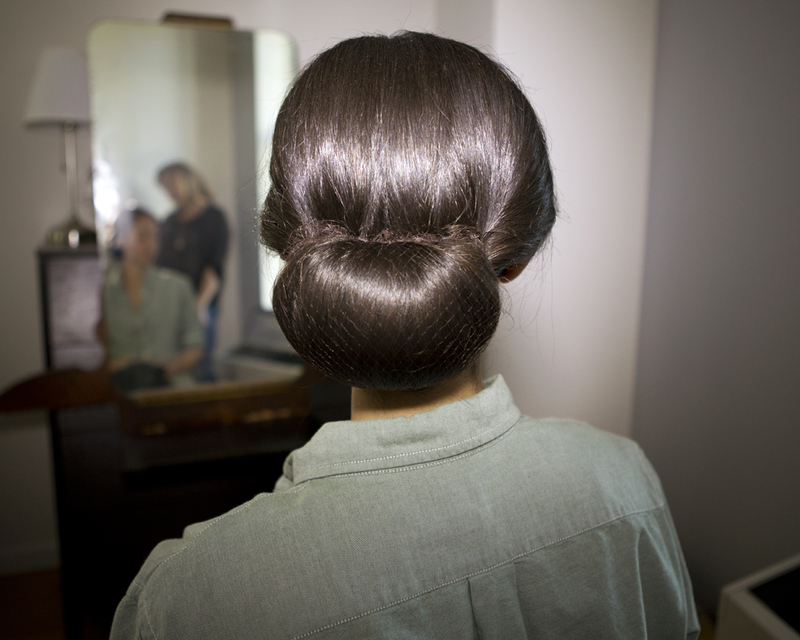 You are currently reading Quite Continental Charm School: Day 18 – Updo and Done at Quite Continental.